Jodi DiCenzo, CFA, CPA, Behavioral Finance Expert, is the founder of Behavioral Research Associates, LLC. Jodi DiCenzo, CFA, CPA, has over 25 years of experience in consulting financial service firms and brings a practical approach to applying academic behavioral research in real world contexts to help optimize individuals’ financial outcomes. Jodi also provides guidance to retirement systems adding defined contribution characteristics to their employee retirement plans. Jodi leads the Behavioral Research Associates, LLC, an applied behavioral research and consulting firm specializing in consumer financial decision making. Jodi founded the firm in 2006 after a four-year partnership with Shlomo Benartzi, Ph.D., one of the most recognized behavioral economic thought leaders. Previously, Jodi was employed by Strong Financial Corporation, where she helped develop the Retirement Plan Services division from its inception in 1995. Before joining Strong in 1994, she was a Senior Manager at PricewaterhouseCoopers, LLC, where she specialized in providing audit and consulting services to financial service firms, employee benefit plans and publicly traded companies. 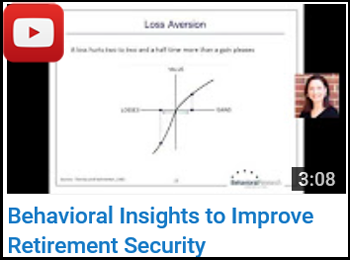 Behavioral Insights to Improve Retirement Security. Jodi’s original research has appeared in BusinessWeek, Financial Planning Magazine, MarketWatch, The New York Times, The Wall Street Journal, and U.S. News and World Report. Jodi is a member of The EBRI Defined Contribution Research Task Force, Plan Sponsor Council of America, The Employee Benefit Committee of the Illinois CPA Society, CFA Institute, CFA Chicago, and The Society for Judgment and Decision Making. Have Jodi DiCenzo speak at your event! 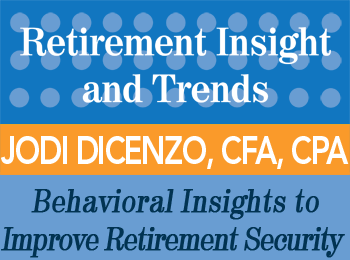 Jodi DiCenzo is an experienced speaker and keynote presenter on topics pertaining to behavioral finance. Please contact us today via email or phone 847-686-0440 x102 if you would like to have Jodi DiCenzo present at your conference or appear at one of your events, or to receive a free voucher to view a sample of one of our speaker’s work. Links Find courses and products from Jodi DiCenzo at the Retirement Resource Center.